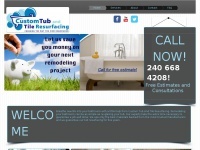 Custom Tub & Tile has been Maryland's leading bathtub refinishing company for more than 30 years . Call today to get an expert quote for your project! three profiles were found for Customtubandtile.net in social networks. Among other social networks the website is represented in Facebook, Twitter and Pinterest. The web server used by Customtubandtile.net is located in Provo, USA and is run by Unified Layer. On this web server 18 other websites are hosted. The language of those websites is mostly english. A Nginx server hosts the websites of Customtubandtile.net. For managing the data of the webpages the CMS WordPress in the version 5.1.1 is used. The website uses the latest markup standard HTML 5. The website does not specify details about the inclusion of its content in search engines. For this reason the content will be included by search engines.